Finals week is coming…all the hard work and stress UW-Green Bay students have experienced this semester will come to a head in a matter of days. How can you help brighten their day? 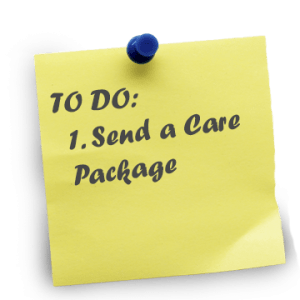 Send them some love from home in the form of a care package or letter. Getting an unexpected package or letter is alw ays exciting! You do not even have to create it from scratch. If you’d prefer, you can contact UWGB’s preferred care package provider, On Campus Marketing and buy directly from them. They have multiple options you can choose from and they are easy to work with. You can contact their Customer Service by calling 1-877-942-7887. On the other hand, if you have your student’s favorite cookie recipe no one can beat, send them your own care package filled with goodies from home. Already stocked them full of food to last awhile? Send them an encouraging letter! Support for your child can be shown even from far away. Stressful times are when you need loved ones the most.